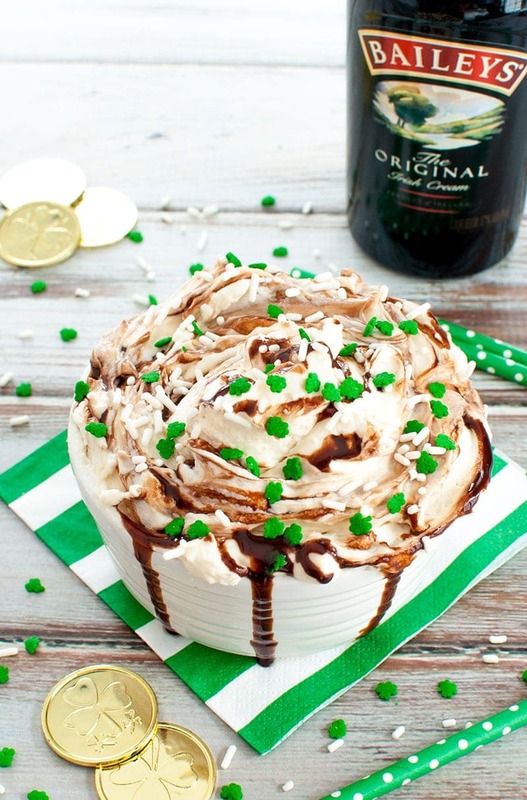 Easy, boozy dessert for St. Patrick’s Day or any adult party. 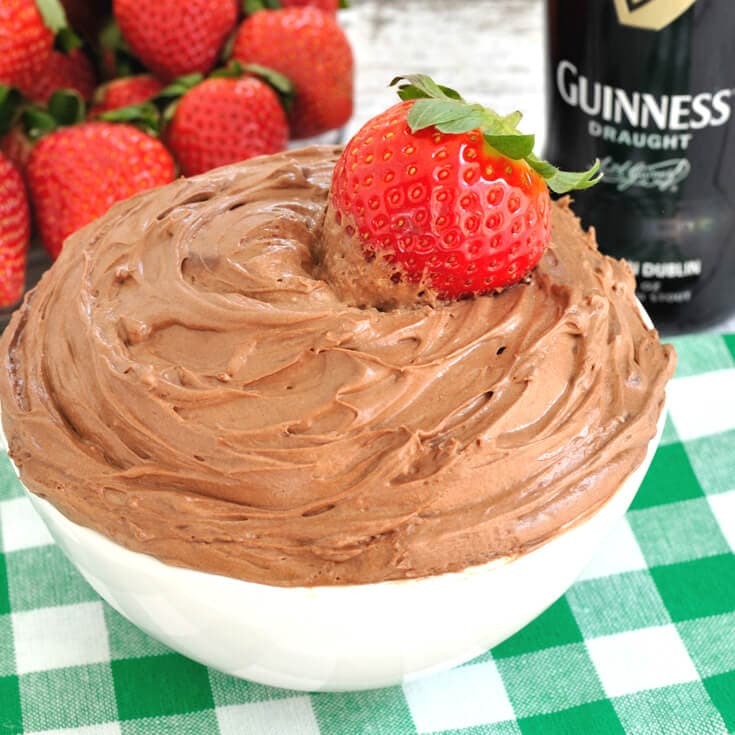 Baileys Irish Cream Dip is a festive and sweet dip your guests will go crazy over! While its name should speak for itself, this dip is made with Baileys Irish Cream liqueur which means this one is a special treat for the adults. 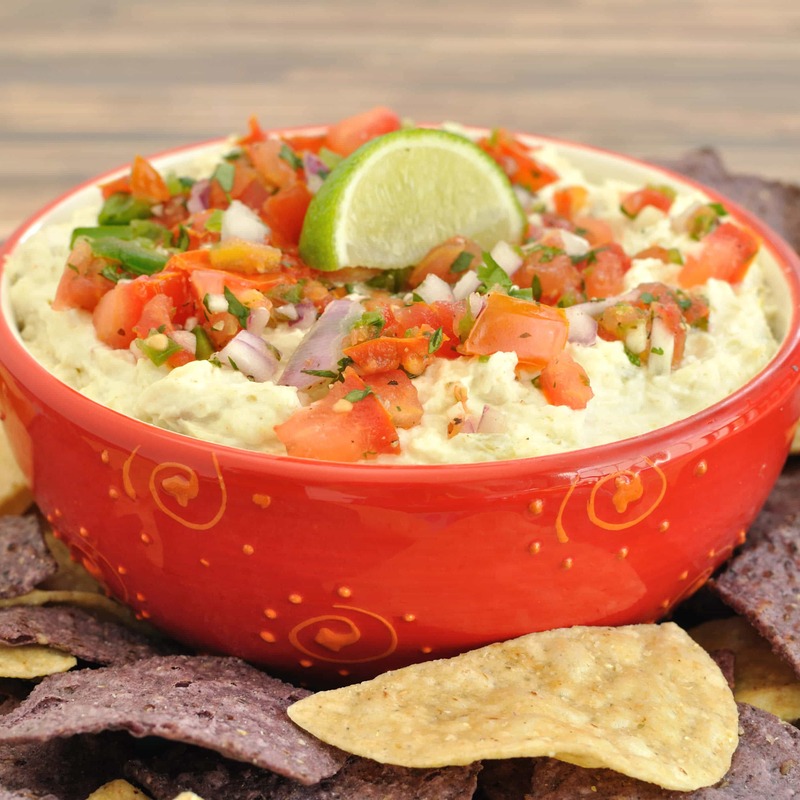 The flavor of the Baileys definitely comes through in the dip, but it is not overpowering. The dip itself is light and fluffy and looks awesome when drizzled with chocolate and covered with festive sprinkles. I used Baileys original, but you could mix things up a bit and try this out with your favorite flavor of Baileys. I’d love to make it again with the salted caramel one. 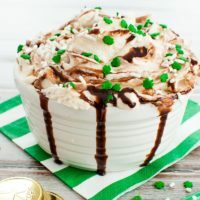 There’s also non-alcoholic Baileys coffee creamers which you should be able to substitute for a non-alcoholic version of this Baileys Irish Cream dip although I have not tried this recipe using the coffee creamer. You can make this a day ahead of time and let chill in the refrigerator. Do not add the chocolate syrup until you’re ready serve. Baileys Irish Cream dip tastes great with fruit, graham crackers, or vanilla wafers. Creamy and boozy cheese cake dip recipe featuring Baileys Irish Cream. 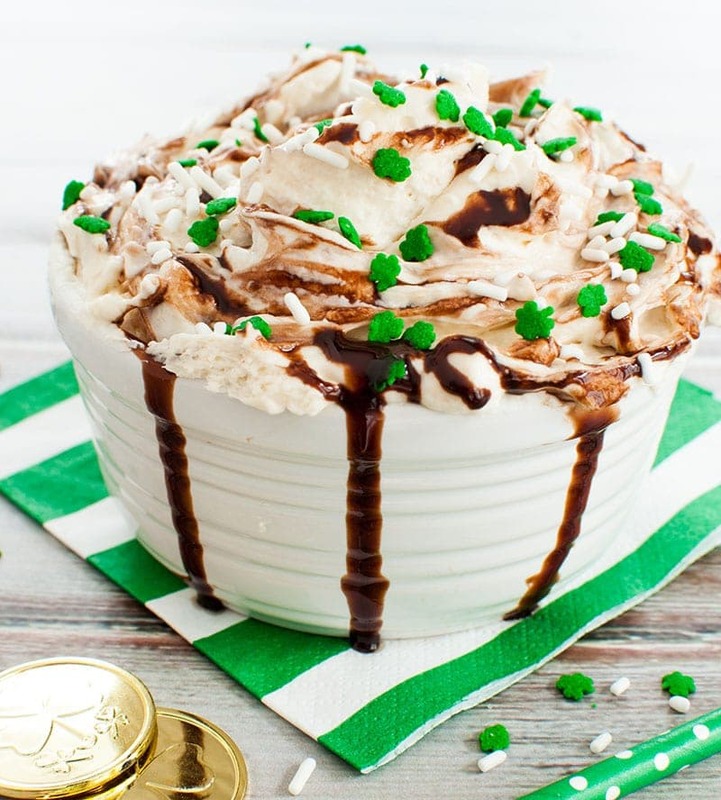 This Baileys Irish Cream dip is an easy and festive dessert for St. Patrick's Day. In a small bowl, whip the heavy cream until stiff peaks form. Set aside. Place the cream cheese into a medium bowl. Using a mixer on medium speed, slowly add in powdered sugar and mix until well combined. Stir in vanilla and Baileys Irish Cream and continue mixing until mixture is creamy. Lightly fold whipped cream into the cream cheese mixture until incorporated. Chill dip for an hour to overnight in the refrigerator. When you are ready to serve, drizzle 1 tbsp of chocolate syrup around the inside of your serving bowl. 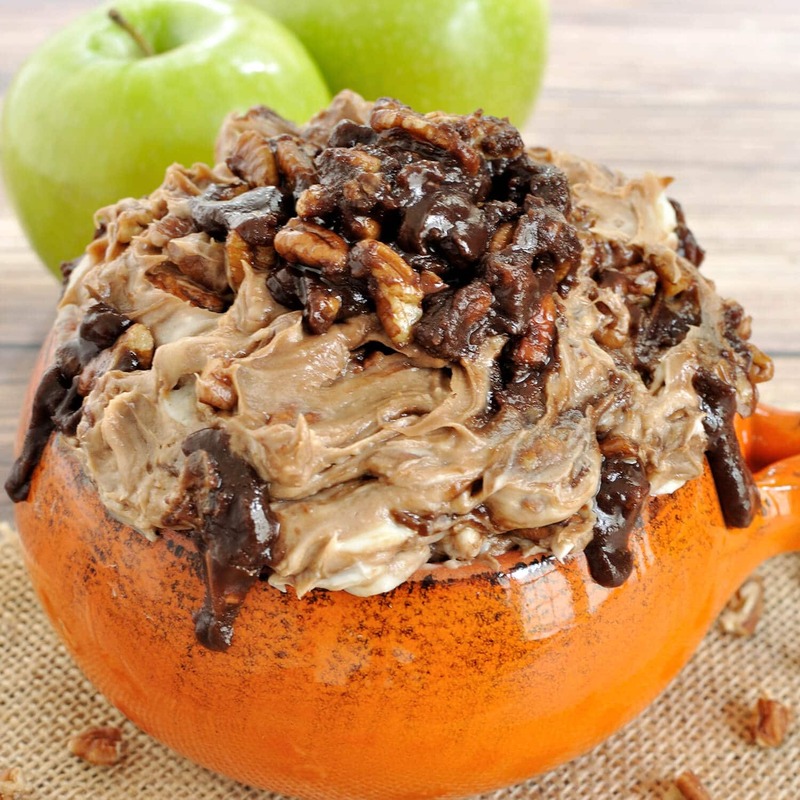 Scoop dip into the bowl and drizzle remaining chocolate on top. With a knife, slightly swirl the chocolate on top into the dip (don't mix completely). Serve with fresh fruit, chocolate or regular graham crackers, or vanilla wafers. Wow, this looks amazing! I want to dive right into that bowl! Oh my! This looks amazing. Oh, wow!!! That is one incredible party in a bowl! I would totally love to devour that entire bowl of goodness with a spoon. That’s normal, right? I am totally in love and can’t wait to make this for St. Pats!! What’s not to love about a sweet dip + alcohol? 🙂 Happy St. Patrick’s Day! Wow, this is so decadent! 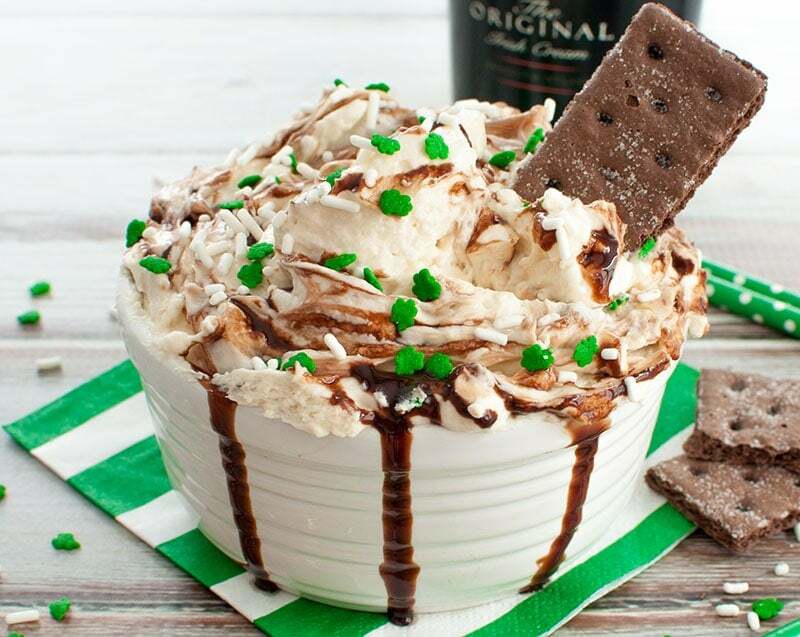 I love Bailey’s so I’m sure this would be incredibly delicious! Wow, this looks so indulgent! Whoa! Those are some amazing ingredients! If this isn’t a bowl of fun I don’t know what is! 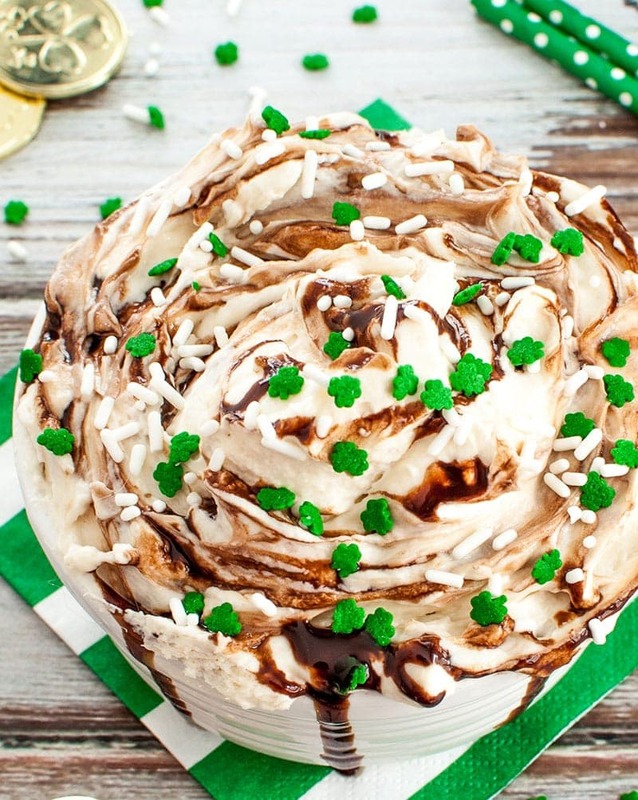 What a perfect St Pattys Day dessert! Definitely making this one! Thanks for sharing the recipe! My jeans are not going to like you!!! How wrong is it to eat this with a spoon???? Could you use a shortcut and instead of the heavy whipping cream, use cool whip? I haven’t tried this with cool whip, but I imagine it would be good! If you try it, let me know how it turns out. Im always getting into debate with my siblings as to why my mother stopped at 6 children although she originally was thinking more along lines of eight. my theory? Turned out 6 is the perfect lucky number. Hahaha It only took her 5 imperfections before Perfect came in the form od me. hahaha Cant neccesarily get Any better than perfect so no need for two more. Hahaha.. This recipe will be confirm such a theory. In my moms eyes anyhow. Hahaha ( even if only for a moment? Im taking it!haha) My mother will LOVE this recipe. What better way to start a new and perfect Thanksgiving tradition? Ha! I’m going to have fun with this Ha!Thank you very much.